Now mobile apps would even help you in increasing the sound quality of any voice recording with their amazing features. Recently I came across Parrot, from Searing Media Inc., a free voice recorder app with which you can Record a conversation, song or a speech, Play them and Share with all. It is based on the dictaphone technology that performs recording of voices, other audio records, telephone conversations, singing or voice overs. With Parrot installed in your Android device you can do voice recording along with a handful of privileges like making it lively and creating undisrupted piece of audio that is supported with a sound wave graph which is to help you in identifying the correct levels of the sound input easily when while recording. The Recording feature can be used with a number of microphone options like the standard mic, the camcorder mic or a Bluetooth microphone. 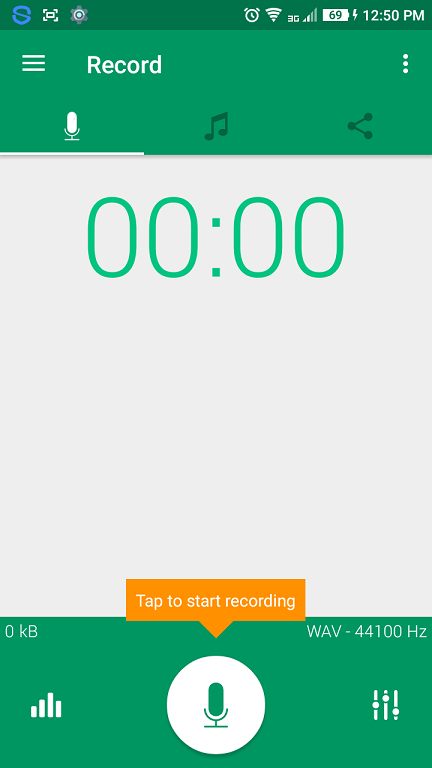 The other major feature in this app is the Playback feature where you can use your voice recordings and store them through a simple and beautiful list that would go handy in easily searching for particular tracks that are supported with intuitive calendar icons that keeps playing as well. What more? You can even use your recordings with a varied number of paused animations. The Parrot app has included in it the in-app sharing facility so that you can share your favorite tracks with your friends and family through just two simple taps. Notifications: The app sends it's users notifications that are simple and easy so that one can keep using Parrot and at the same time can continue to work with other applications. Android Wear: You can use the Parrot app in your Android Wearable if you use one and can Manage your recordings as well as the playback options directly from your wrist and this would really be fun as you don't need to hold a bulky device on your hand and be occupied by it while on the move. Choice of Quality: The Dictaphone Recording Options allows you to record in MP4 and WAV formats so that the users can choose their preferred sample and bit rates. Effects: Parrot has its built-in recording effects which includes the high end options like removing the background noise, automatic control gains and phasing out echoes. There is even the option for setting up one's own custom gain in case more power is required. Skipping silence: The users of Parrot can easily skip out silence or use the automatic pause feature while recording. The app allows you to pause and restart during a recording session whenever the user feels it necessary based on the time lapse and sound sensitivity spans. Alerts: To avail and manage the skip silence or restart/pause mode both vibration and beeps can be used as alert types to let you know when the recording is starting and when it has been stopped. Boosting up the Bass: Here you can Boost up the bass element in your soundtrack amplifying the low frequency elements of the recordings, if any. Volume Booster: Increasing the volume of your favorite track is easy and you can hear even the low volume bits with equal clarity of sound. Preset and Reverberate : Listen to your recordings with the variety of Preset surroundings and reverberate them exactly the same way as it would have been while played in a small room, in a large hall or in an open air sit out. i) Record Audio: The app would ask for access to the mic of your device to create the voice recordings. ii) External Storage: The app would ask for the access to your SD card as they prefer it to be their location to store the tracks. Parrot as an app has a simple, neat and clean layout without any extra push for radical designs. You get the icons and buttons easily accessible, read and understood, rather than keeping the users at dismay. I liked the color scheme as it appears to be quite fresh and eye grabbing, and yet it keeps a "working atmosphere" in its total disposition. 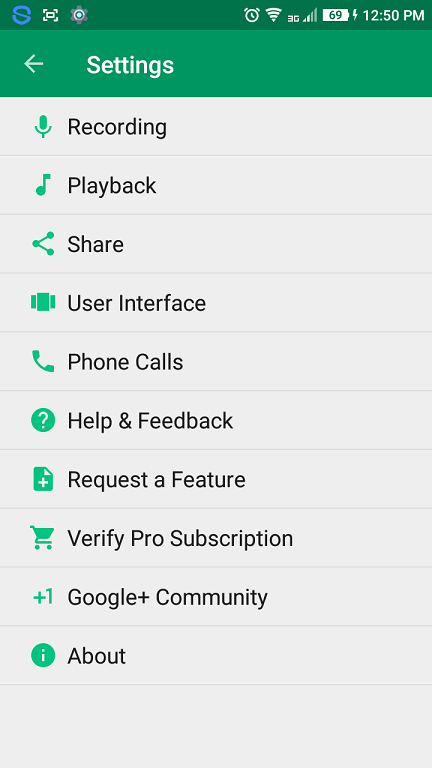 Parrot is basically a free app that does not bother its users with ads or restrictions,and that really made it stand right in the front row leaving many others behind. Parrot consumes only a space of 1.1 MB of your device, which is worth more than it with the kind of features and level of optimization it offers. The app is equally functional with tablets and phones and blends perfectly with the latest version of Android. The features are quite up to the mark especially the effects which can enhance the volume and boost the feeble recorded areas. 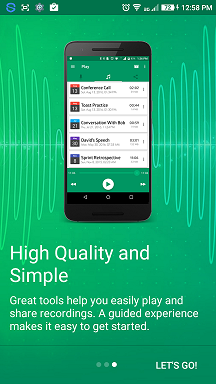 The sound quality delivered through this app is with high clarity and flawless. There is a well equipped library in this app that makes it all easy for the users to keep replaying their stuff and even rename them as many times they want. Different formats are supported in this app which never let you down while sharing or receiving any audio track. The user interface is simple and looks good and at the same time maintains the right balance between entertainment and functionality. There are no annoying ads popping up every now and then, nor is there any restriction to disrupt your user experience. The Auto Pause did not work as I expected, though the buttons like stop and start were there all along. There is yet no standalone app prepared for the Android Wearables which creates a little bit of hitch in the integration affecting the performance a little which you would not generally expect. Parrot as a sound recording app works well with all the basic features leaving no chance to complain. The features are great and work fine which is a little bit surprising as they are asking nothing for it. 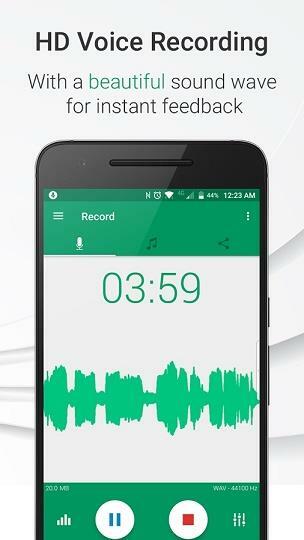 For Lollipop users they have included a voice recorder that could fit well in with their device. The app has maintained their basic standard quite high and in return they don't try the user's patience with unnecessary ads or keeps them stranded with unreasonable restrictions.